Em estoque a partir de 1/Maio/2019. Faça agora seu pedido e pague somente quando for enviado. In this gorgeous and comprehensive new cookbook, Chef Migoya begins with the essential elements of contemporary desserts—like mousses, doughs, and ganaches—showing pastry chefs and students how to master those building blocks before molding and incorporating them into creative finished desserts. He then explores in detail pre-desserts, plated desserts, dessert buffets, passed desserts, cakes, and petits fours. Combining Chef Migoya's expertise with that of The Culinary Institute of America, The Elements of Dessert is a must-have resource for professionals, students, and serious home cooks. IN THE ELEMENTS OF DESSERT, RENOWNED pastry chef Francisco Migoya and The Culinary Institute of America take you on a guided tour through the innovative flavors, ingredients, and techniques in the thrilling world of desserts. 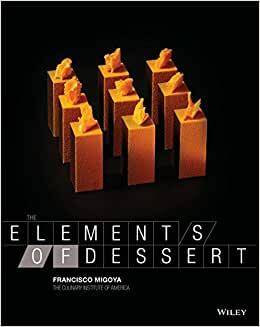 He explains the art of dessert through its most essential and fundamental elementssuch as mousses, doughs, and ganachesrevealing in each recipe how to incorporate these building blocks into inventive, unforgettable delicacies. He begins by covering the core concepts and techniques, including flavor breakdowns focused on combinations and compatibility; basic pastry methods; principles of dessert and menu composition; preparation methods for essentials such as custards, creams, and meringues; and chocolate making and tempering basics. PRE-DESSERTS: Semi-sweet small dishessuch as Goat Cheese Bavarian Cream with Beet Jelly and Date Pound Cake Crumbsintended to bridge the gap between savory main courses and fully sweet desserts. PLATED DESSERTS: Simple, modern, and elegantly plated recipes like Toasted Milk Panna Cotta Covered in Caramelized Milk Chocolate with a Crisp Croissant Crouton and Devil's Food Cake Soup. DESSERT BUFFETS: A wide range of small items from which diners may choosewith an emphasis on dishes that will keep, as well as on visual impact and presentationsuch as Chocolate Blackout Cake with 64% Dark Chocolate Mousse, Luxardo Cherries, and Crème Fraîche. PASSED AROUND DESSERTS: Small nibbles that are plattered and passed around the room, usually in easy-to-handle forms like lollipops or macarons. Sections on cakes (Entremets) and petits fours (Mignardises) round out this collection of awe-inspiring desserts and highly sophisticated techniques. With Migoya's unique approach and clear guidance, combined with gorgeous and instructive photography, The Elements of Dessert offers a comprehensive education that will empower pastry students and working professionals alike to reach new heights in both flavor and presentation. "The world of pastry rejoices; Francisco shows us once again that there is still much to say in this profession, and this book is an honest reflection of a person who does not lose sight of tradition, even when working from a contemporary and modern perspective. Perfection, technique, philosophy, purity, andabove alla very personal aesthetic defines this work in all of its aspects." "In The Elements of Dessert, Chef Migoya displays his skillful and learned approach to producing today's most innovative pastry. Included is a plethora of new techniques, new flavor combinations, reinterpretations of form, and forward-thinking designoverall, a pleasure to behold." "The Elements of Dessert is a work that goes well beyond techniques and recipes; it will help the reader understand how and why things work. The greatness of Chef Migoya is his ability to explain the complicated in a simple way. This is one of the most detailed, reliable, and honest books ever printed about dessert." "Francisco Migoya has presented us with this compilation of the knowledge accumulated over decades, and distilled it with his brilliant eye. The Elements of Dessert will be an indispensable book in the kitchens and libraries of gastronomes everywhere." "The Elements of Dessert is the book I searched for as a young cook, looking for answers and inspiration, and the book I will now turn to for the same reasons. Chef Migoya has created a powerful new tool for our trade and has a masterful way of explaining and presenting techniques and ideas." "Every page makes you stop and think twice. Francisco Migoya's books always push the envelope on the most cutting-edge techniques and ingredient combinations. Behind the elegant plating and the simple organization, every recipe has great depth and is a great source of inspiration for chefs and serious cooks alike." "I knew of Francisco Migoya's work before I met him in person. He and his work are fully interconnected and in perfect balance: in him is an image of what he does, and his work shows us who he is. He is a great source of information and knowledge, and he will continue to delight us with his advice, techniques, recipes, and presentations. I want to thank you, Francisco, for what we have seen and for what we have yet to see." You will want to put this cookbook on your coffee table to impress your foodie friends. The pictures are an incredible showcase of the modernist ingenuity of the recipes. The layout of the book is very well thought out. You must be prepared to invest in ingredients and equipment to make the majority of the recipes in this book. A suitable amount of background is recommended before attempting the recipes found later in the book and this background is provided in Chapter 1. Do not skip this chapter! The first chapter provides an extensive explanation of preparation and cooking methods (for example: tempering chocolate), an overview of flavor and texture profiles of ingredients, and even considerations in menu composition. Subsequent chapters contain recipes and photographs grouped by the type of setting under which the dessert would be served (such as plated, in a buffet, cakes, etc.). The ingredient amounts in the recipes are weight based so at the very least you must have a kitchen scale. In the end of the book is a list of on-line resources where unique ingredients or tools can be purchased which I found very helpful. I'd recommend this book to anyone who has an appreciation of culinary artistry, and strongly recommend this book to chefs who enjoy modernist cooking. I love Francisco's books. The photography is out of this world ( Ben Fink )The information contained is almost too specific as if he is standing over your shoulder cringing at your mistakes. The procedures outlined in the book are no secret but should get the novice through the technique without questions. I have read Francisco's books and blogs and interviews. With this experience I can say Erin McDowell makes this book kind. Not Mr. Migoya's strong suit. Must have for industry folk. And pretty to look at for the foodie without a industrial kitchen. 5,0 de 5 estrelasPastry chef approved. Fantastic book with a wealth of great information and recipes. The recipes are very extensive so I can only recommend for pastry chefs as I am one myself. Great resource for inspiration. Love this book! Giving me a lot of ideas and inspiration, but the techniques are definitely for professionals or extremely experienced home-cooks. Amazing book, but difficult for the home cook, I think. This book was required for my pastry class at culinary school. The pictures are really nice to look at.